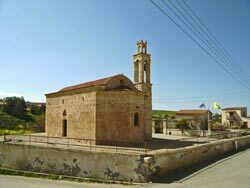 In the southeast edge of the community stands the old church of Agios Georgios, a 16th century building and in particular of 1540. 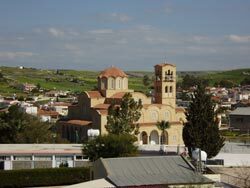 According to Karouzis, verbal tradition states that the church was constructed by Aekaterini Cornaro, queen of Cyprus. The church is a single-roomed basilica with its dimensions being 6X15 metres. Preserved on the church walls are remnants of frescos indicating, as Karouzis remarks, that originally the church was entirely covered by frescos. The only preserved fresco is the one depicting Agios Demetrios and which is located on the southern wall of the main church. The chancel which adorns the interior of the church is more recent than the church and it was created in 1975 by wood sculptor Chrysanthos from the city of Nicosia, since the older chancel of the church had been ruined. Although the old chancel of the church is not preserved, several 15th century icons have been preserved, including the one of Saint John the Evangelist, as well as the old bema-door. Additionally, one is worth observing the anaglyph head of the lion at the north entrance of the church. The new church of Agios Georgios was built in the west entrance of the community. It is a three-roomed church of byzantine type. The church is 32 metres long and 24 metres wide, whereas its height is 20 metres. It was completed in January 2010 and its doors opened on the 22nd of April 2010, in the presence of the Metropolitan Bishop of Morphou, Mr. Neophytos.